The Mares Dual 15x is a recreational divers dream. 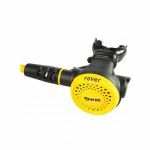 Simple but effective, this regulator will act as the perfect companion on your dives for years to come. Whether you’re just starting out or have been diving for years, then the Mares Dual 15x Regulator is a great choice. The 15x has been a staple of the Mares 1st stage range for a number of years and with good reason. Deemed an entry level first stage by most divers, it doesn’t let that reputation stop it from being jam packed with outstanding features. As is standard with all Mares 1st stages, the 15x comes with a dynamic flow control port. Dynamic Flow Control allows the user to easily manage the supply and flow of air through the regulator. Plus all of the ports on the 15x come pre-orientated which helps to create a better angle for your hose, stopping kinking and ensuring you don’t lose any hose length. The compact size of the 15x combined with the lightweight nature of the Dual 2nd stage makes this a perfect travel regulator for those quick trips abroad. Coming in DIN or A-Clamp (INT), the regulator weighs between 911g to 1.1kg including the hose, dependant on the set up. Plus the sandblasted finish of the 15x protects and adds a stylish flair. The Dual 2nd stage is brand new for 2019 and oozes quality. One of the less pricey Mares 2nd Stages, it doesn’t sacrifice any quality for its lower price tag. Comprised from lightweight technopolymer, the Dual is extremely lightweight and won’t add too much weight to your setup. But don’t think that means it loses any durability, the Dual is as strong as they come and you won’t feel hindered. As with all Mares Regulators, the Dual 15x comes with a vortex assisted design, this helps to make breathing through your regulator easier whatever the depth and density of air. The regulator is perfect to pair with an octopus, you can see a variety of octopus options when purchasing this as part of our Mares Dual 15x Regulator package. The Dual also comes with an oversized purge button which is easy to access at all times. This makes purging your regulator quick and easy no matter the scenario. The Dual comes paired with a Superflex hose as standard. The Superflex Regulator hose has been a companion to Mares regulators for years and will be an equally good companion to you. Dynamic Flow Control - As is standard with all Mares 1st stages, the 15x comes with a dynamic flow control port. Dynamic Flow Control allows the user to easily manage the supply and flow of air through the regulator. Pre-Orientated Ports - All of the ports on the 15x come pre-orientated which helps to create a better angle for your hose, stopping kinking and ensuring you don’t lose any hose length. Compact - The compact size of the 15x combined with the lightweight nature of the Dual 2nd stage makes this a perfect travel regulator for those quick trips abroad. Sandblasted Finish - The sandblasted finish of the 15x protects and adds a stylish flair. Lightweight Technopolymer - Comprised from lightweight technopolymer, the Dual is extremely lightweight and won’t add too much weight to your setup. Oversized Purge Button - The Dual also comes with an oversized purge button which is easy to access at all times. This makes purging your regulator quick and easy no matter the scenario. High Air Flow - As with all Mares Regulators, the Dual 15x comes with a vortex assisted design, this helps to make breathing through your regulator easier whatever the depth and density of air. Superflex Hose - The Dual also comes with a Superflex hose. High quality and high performance, the Superflex Regulator hose has been a companion to Mares regulators for years and will be an equally good companion to you. Who is the Mares Dual 15x Regulator For? If you’re looking for an affordable regulator which won’t break the bank but still provides outstanding quality then look no further than the Mares Dual 15x. High quality and high performance, the Dual 15x matches great features with affordability to make this the perfect regulator for the casual diver.